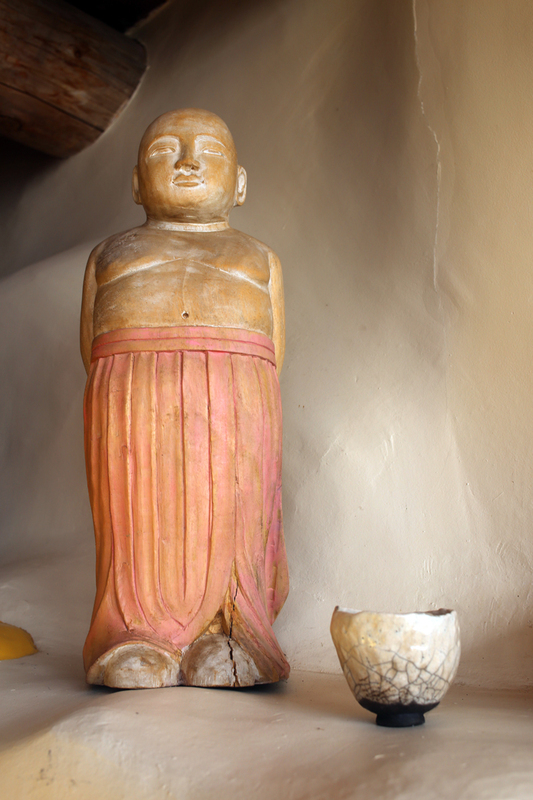 Tizia O’Connor’s Auromesa is an Ayurvedic Haven on Hondo Mesa. The Earth Ship she has lived in for over two decades includes a casita that is used only for Tizia’s Practice, but she and her husband Paul’s home includes a meditation room which she uses in her work along with the kitchen where Tizia spends much of her time, cooking up her healing foods and remedies. A new outdoor therapy pool Paul built for her to use with her clients has just been completed. Stylish in that very French, undone way, Tizia is the epitome of effortless chic. 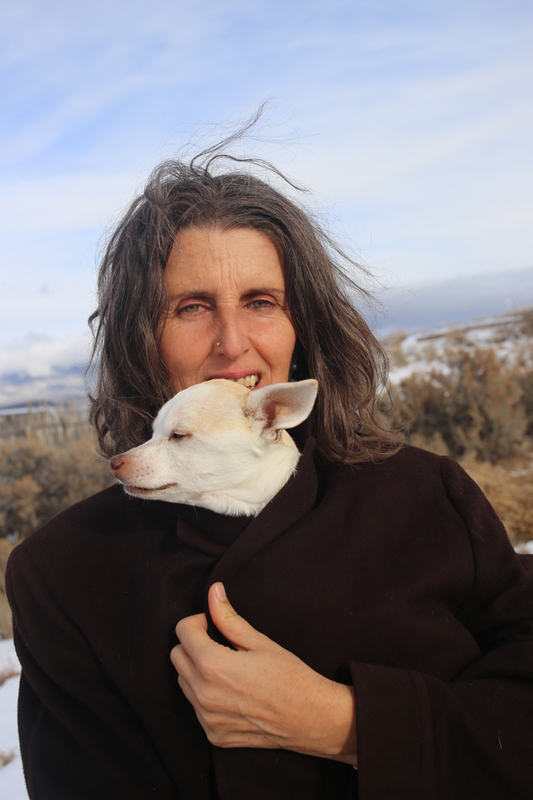 One would never guess she was one of the foremost Ayurvedic practitioners in the West. 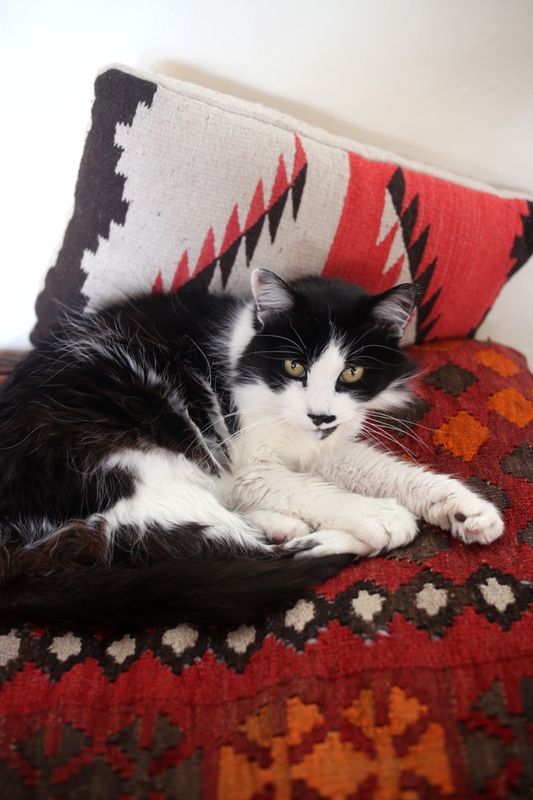 Tizia’s knowledge is vast and deep and her serene nature speaks volumes about the work she does. This is a woman who lives her beliefs. Tizia says that during their seven years in France (where she is from) with their daughter, she often wondered why they were hanging onto the Hondo Mesa home. Now she says, it is obvious; it was for this time, this work she does now. For several years Tizia vounteered in a clinic in India for a couple of months annualy, now people from all over the world, including India, come to Auromesa. I am apparently on Vata Pita (Air and Fire) overload and need to be calmed down. She tells me how to make ghee and explains it is medicinal and a great carrier for the potent herbs and spices she cooks with. For the past week I’ve been making nourishing stews and soups and I do notice a difference. Earlier, while Tizia concocted an Ayurvedic oil containing what appeared to be a thousand herbs and the soup simmered on the stove, Paul took Bill Curry and I for a tour of the property and inside the Auromesa casita I noticed several Japanese paintings hanging in the guest room. 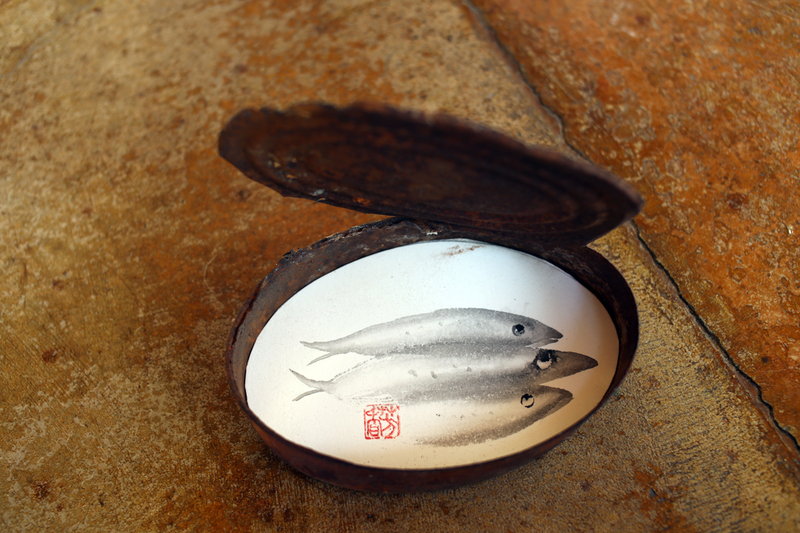 I had no idea these were Tizia’s until she showed me a rusty sardine can with a painting of a fish attached to the bottom. 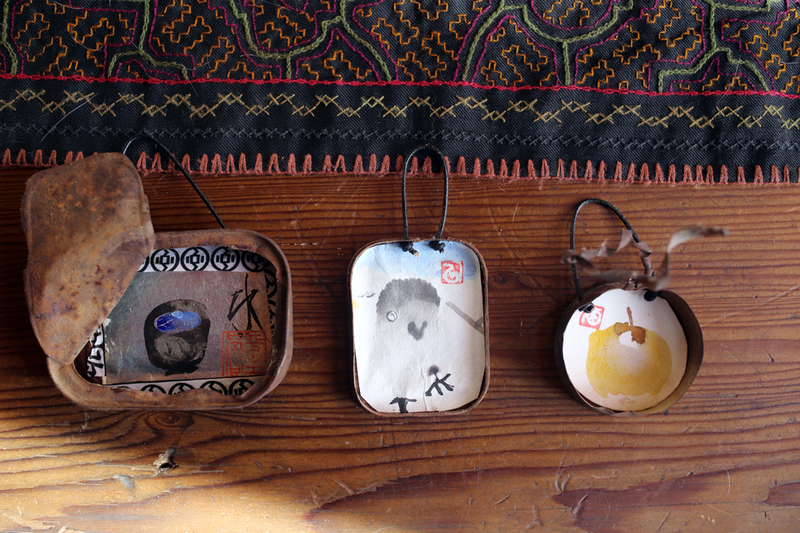 A gifted artist working with Japanese ink-wash techniques, these days she collects rusted tin cans and lids on the Mesa to frame her delicate and beautiful images. This very Wabi Sabi approach is reflected throughout the couple’s warm and creative home. 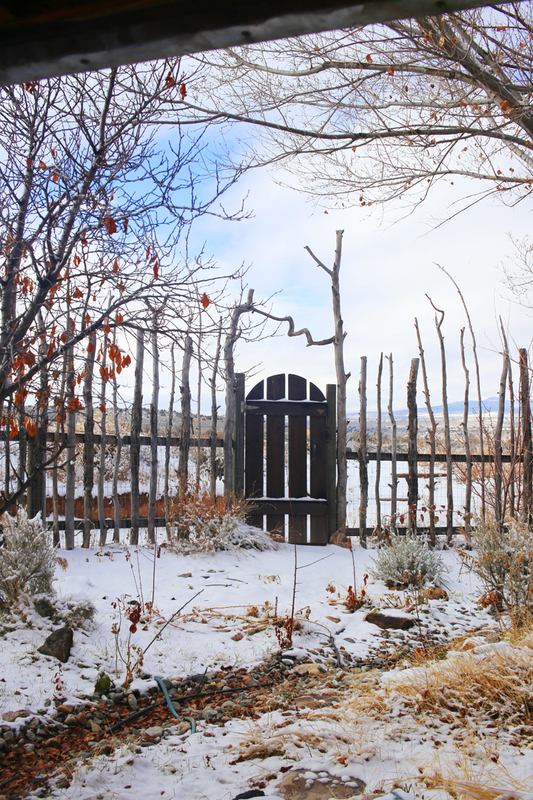 Before we left, she invited us to see the labyrinth she and Paul have created, it was covered in snow, but i followed the path around and around, warmed inside and out by the soup and the soulful space. January 7, 2015 in Art, The Body Beautiful. Love that special spot and these special people.